The command selected is shown in the Command frame. If any shortcuts are assigned to this command, they are displayed in the Old shortcut(s) text box. 1. Click on the white New shortcut(s) text box, and press the appropriate keys on the keyboard. The shortcut will be recorded and displayed in the text box. 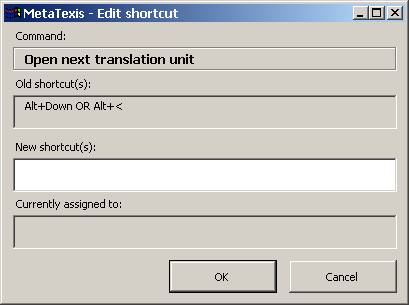 If the shortcut is assigned to another command, it is displayed in the Currently assigned to text box. 2. To pre-save the shortcut(s) defined, click the OK button. Note: Any new shortcuts are not saved until the settings in the General options dialog box are saved by clicking on the OK button.